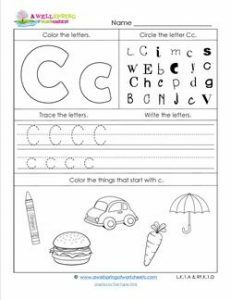 Kids will have fun with our abc worksheets, especially this one for the letter c. Can they identify the letter c in all those different fonts? Can they tell which objects begin with the letter c? I bet they can! I bet they can trace those uppercase and lowercase Cc’s really nicely, too, and write a few more just as good as they traced them. Pull out the crayons and color as directed on this page. Coloring is always tons of fun, especially for kids (and sometimes for grown-ups, too! ).